In November 2015 the world of motorcycling witnessed the next chapter in the MT story: the arrival of the MT-10. Shaped by the unstoppable force of creative energy coming out of the Dark Side of Japan, the MT-10 is the most powerful motorcycle that the MT world has to offer. Equipped with a 998cc, torque-rich, crossplane engine and highly agile Deltabox chassis, the bold and aggressive new MT-10 is ready to unleash a whole new riding experience on to the streets of Europe. 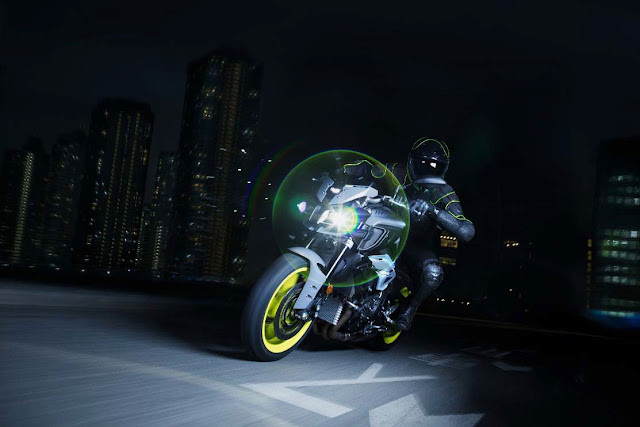 With the MT-10's arrival in dealer showrooms scheduled to coincide with the start of the main riding season in Europe, Yamaha can reveal the key technical specifications that have been shrouded in darkness since the bike's public debut. Producing 118.0kW (160.4 PS) @ 11,500 rpm, this high performance naked bike has the power to dominate its environment - and with a strong and linear torque output that peaks at 111.0 Nm (11.3 kgf-m) @ 9,000 rpm, the MT-10 delivers thrilling acceleration for an adrenaline-charged ride at all speeds. Benefiting from a short 1,400mm wheelbase as well as an 825 mm seat height- and weighing just 210 kg with a full oil and fuel load - this Ray of Darkness is equipped to deliver light and agile cornering with solid straight-line stability. UK of £9,999 (incl. VAT)*, the new MT-10 underlines the company's commitment towards bringing value to every sector of the marketplace. As well as laying claim to the title of ultimate naked, the radical new MT-10 is one of Yamaha's most versatile large capacity models. Besides being built to satisfy every thrill-seeking rider's adrenaline cravings, this eagerly awaited 998cc, high specification performance bike is also ready to go the distance. sports character - while longer distance customers can enhance functionality and practicality with a range of bolt-on components including a medium height sport screen, soft side cases, heated grips and a comfort seat. All Genuine Accessories can be ordered from the Yamaha dealer with the new MT-10, or fitted post purchase. yellow wheels and engine side bars, as well as fluo highlights contrasting with the grey bodywork. The new 2016 night fluo version of the MT-07 Moto-Cage will have a retail price of £6299 inc VAT which is unchanged from last year's model.